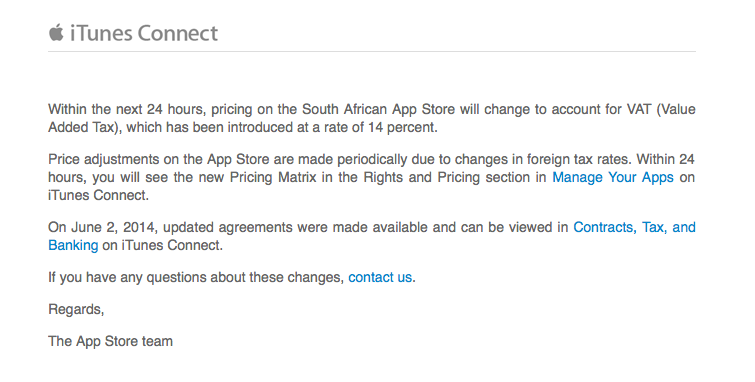 This weekend, Apple has notified App Store developers that the South African App Store will see app price changes due to the country’s new 14% Value Added Tax rate. Apple commonly makes these changes to align with tax changes in certain regions. It’s likely that these price changes will spread to other Apple web properties such as the iTunes Store and iBookstore. Expect to see these changes within the next 24 hours. A new pricing matrix can be accessed by developers in iTunes Connect. Update: Several readers report that games were previously held up by a dispute with the Films and Publications Board responsible for approving movies, games, and other content before going on sale in the country. No word on the resolution with Apple, but it appears they are now allowing Apple to sell games to iOS users in South Africa. Apple has flicked the switch on the ability for developers to offer their games in the iTunes App Store in South Africa. It is unclear why Games have been unavailable in the country until now. A look at the South Africa App Store shows that the Games category is now active. Apple informed developers of the new ability to sell games, and the company tells the creators that games will automatically appear in the South African store. We’re pleased to announce that games are now available on the South African App Store. All apps in the Games category that are cleared for sale in South Africa will be automatically available on the South African App Store. No additional action is required on your part. If you need to make changes to the territories where your apps are available, visit the Rights and Pricing section of the Manage Your Apps module on iTunes Connect. Apple is celebrating the addition with a large Games banner at the top of the App Store in South Africa (shown above).